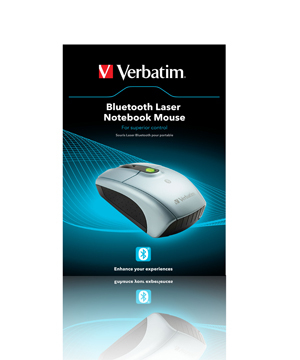 Verbatim's Bluetooth® Laser Notebook Mouse features Bluetooth® wireless technology. It is quick and easy to set up with your Bluetooth® computer for a tidy wire free environment. For precision movement and control the mouse uses laser sensor tracking. *Computer with Bluetooth® wireless technology installed is required. Speed control - change speed with one touch. 3 settings with up to 1600 dpi sensitivity. Laser - precision movement and control with laser sensor tracking. Mac OS 10.4.X and higher. * Computer with Bluetooth® wireless technology installed is required.